Let’s talk about some simple ways to do competitive analysis. I’m just going to go through a couple of tools I often use. First and foremost is Ahrefs, which I use all the time. If you want to get access, just go to growtheverywhere.com/ahrefs. Let’s put Nike into Ahrefs, as an example. You can see that their domain ranking/domain authority is scored on a scale of 1-100. Nike has 73, which is great. They have over 105,000 referring domains pointing to their site. They ranked for over 500,000 organic keywords, which means that they drive over 8.8 million visits per month. Now, these are by no means exact numbers, but it does give you a realistic range in terms of where Nike’s at and how many keywords they’re bidding on. 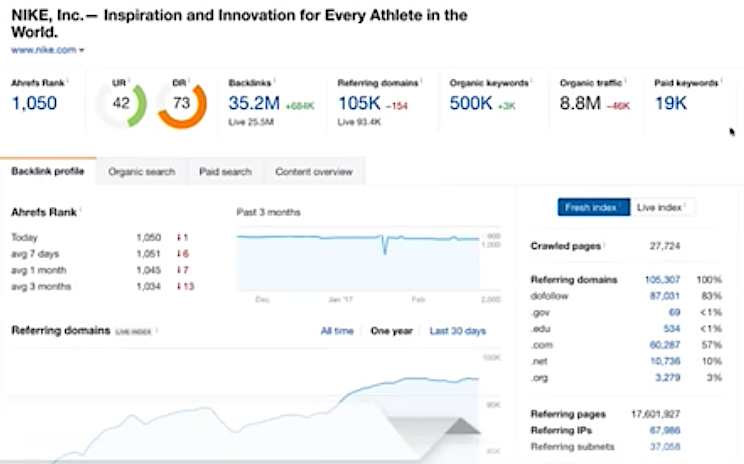 You can start with organic keywords and see the keywords they’re ranking for, the volume they drive, which pages they’re ranking for, and go from there. You can also see what features they have for specific keywords. Do they have site links? Are they in the image pack? Are they in a knowledge panel as well? …they have an ad showing. Then they have a link right there. They have images. They have the knowledge box, as well, and so on. I also like to look at ads (to see what types of offers and images they’re using), as well as top pages (to see what I or my client can emulate). 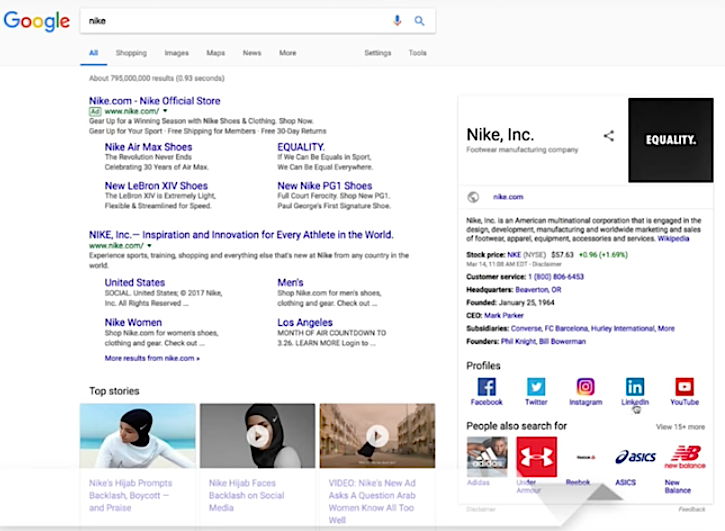 With Nike, there’s obviously a lot of Nike-related branded keywords, but we want to see what else they have that’s not tied to Nike specifically. Alex Morgan, the soccer star, is ranking 14 for it. “Nike size chart,” “10K training plan,” I can see all these different keywords right here. Obviously, for the brand-related keywords, they’re going to do well on those almost always. But I can get some ideas from their other top pages and see how I can emulate those. Ahrefs can also help you see the content gap, which is just great. For example, I can type in Nike.com, Adidas.com, Reebok, etc. By doing this, we can see all the things that Nike and Adidas rank for, but that Reebok does not rank for. Now let’s look at marketing blogs. Let’s look at Neil Patel, Quick Sprout, and Single Grain. This will give me some content ideas. 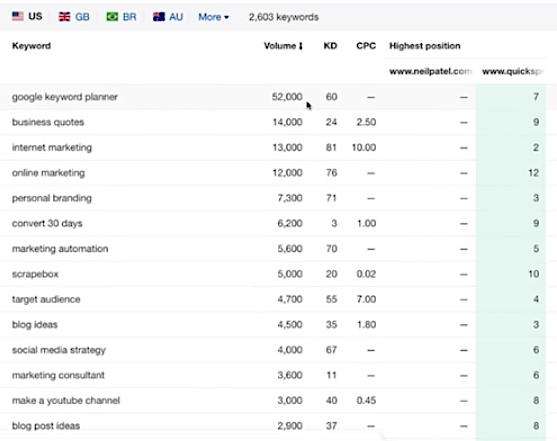 We can see that Quick Sprout ranks for all the expected keywords: they’re #7 for “online marketing” and #12 for “marketing automation.” A lot of great keywords that can help me (if I were a competing marketing blog) come up with great ideas for the types of content I should be creating. Then I can just export this info, maybe select 1,000 rows, for example, and hit export. We can also look at PPC keywords. Going back to Nike—what are they bidding on, exactly? What’s the URL? We can look at their top landing pages, too. All this will help us get an idea of what they’re doing. So, there’s a lot that we can do with Ahrefs. Just go to growtheverywhere.com/ahrefs. 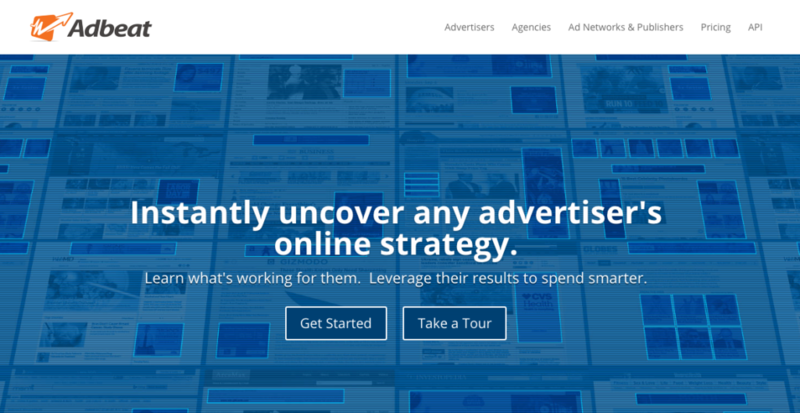 Another great tool that I use is Adbeat. Adbeat gives me a deeper look at how certain companies are spending, what ads they have, and where they’re spending. Let’s take Jet for example. Let’s say they spend $121 million. 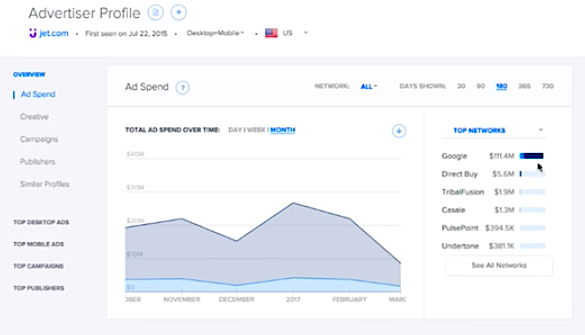 You can see that their ad spend is actually increasing over time. Most of their spend is going towards Google, and to Direct Buy as well. Then we can look at the different kind of creative stuff they’re running, and how much spend went towards this creative component. We can also look at their newest campaigns. We can look at competitors, too. And, just as we did with Ahrefs, we can export all this Adbeat info and make it into a PowerPoint presentation. That’s a lot of actionable information at my fingertips. One thing to keep in mind is that usually the spend amounts on these kinds of tools are incorrect. Same thing with a traffic map. I would say take the traffic or the ad spend with a grain of salt. 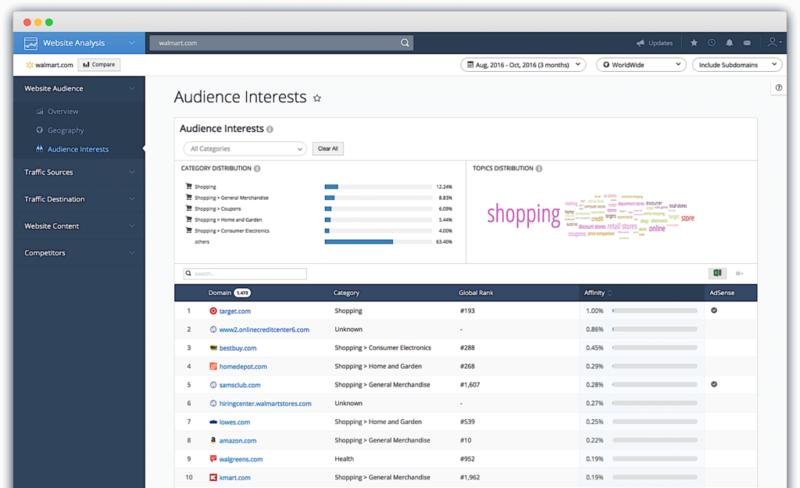 Finally, let’s look at SimilarWeb, another tool I love to use for investigating competitors. Let’s go back to Nike and look at how they’re doing. We can see that this is their traffic trends over time. It’s saying that they get 54 million visits a month. Category rank for shopping and sports, they’re number one. It shows you the different mobile apps that they have for Google Play, App Store as well. Lot of different stuff going on here. 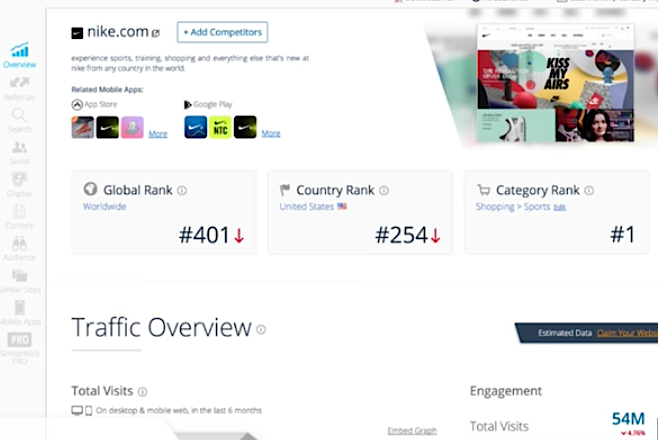 You can see their traffic by country and where the bulk of their traffic is coming from and where their referrals are coming from. It’s search, and then direct, and then you have referrals, too. You can see keywords plus which are paid, their social and how they’re doing there. You can see their distribution and then display advertising. Their sub-domains, too. You can also dive deeper and look at certain categories. 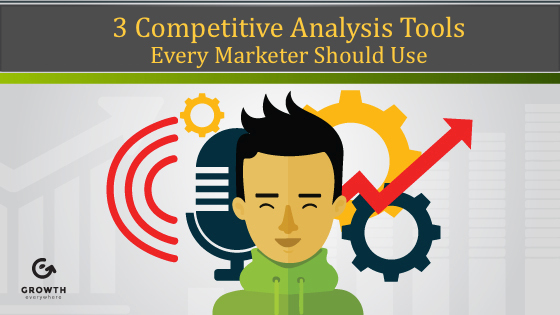 So, with these three great competitive analysis tools, there’s a lot that you can see.